Luis Rengifo circles the bases during one of his 11 home runs with the Clinton LumberKings this season. CLINTON, IA (August 6, 2017) - Clinton LumberKings infielder Luis Rengifo was packaged in a four-player trade between the Seattle Mariners and Tampa Bay Rays. Rengifo was sent to the Rays along with minor league left-handed pitcher Anthony Misiewicz and a player to be named later for Major League right-handed pitcher Ryan Garton and minor league catcher Mike Marjama. Rengifo, 20, was with the LumberKings since opening day and quickly earned a reputation as the team's most versatile player. During his 102 games in Clinton he played second, third, shortstop, left field, and right field the most positions played by a LumberKing this season. 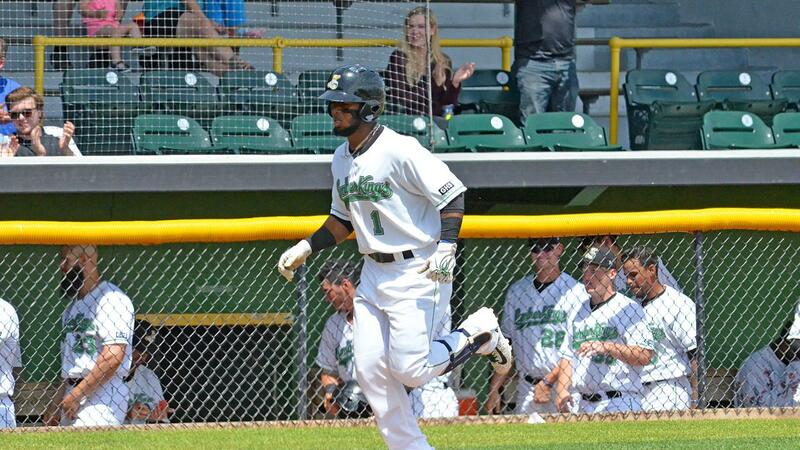 Rengifo leaves the LumberKings as the team leader in stolen bases, 29, and second on the team in home runs with 12. In the Midwest League, Rengifo ranked tied for second in steals and will also be remembered for tying the franchise record for steals in a single game. The Venezuelan native stole four bases in a May 18 game at Ashford University Field against the Burlington Bees to tie Alan Wiggins 1979 feat for most steals by a Clinton player in a single game. Rengifo joins former LumberKings right-handed pitcher Brandon Miller as the second LumberKing from the 2017 team to be involved in a trade this season. The LumberKings play game two of their four-game series with the Peoria Chiefs on Sunday afternoon. Right-handed pitcher Ljay Newsome (5-8, 4.91) will take the ball for Clinton and face Peoria right-handed pitcher Frederis Parra (3-3, 2.88). Game time is slated for 2:00 PM (C.D.T.) with the pregame show on 100.3 FM WCCI beginning at 1:45 PM, Erik Oas will be on the call. The game features the final baseball card strip giveaway of the season presented by Clinton National Bank and Medicom. Special ticket offers to Sunday's game are available for residents of Fulton and Morrison.